Please wait we are processing your request. This information will be used for proposal formatting only. Click on map to view a larger map. After you complete our online service availability form, our system will generate you a proposal. Please process your order within 30 days as this proposal will only be valid for 30 days. We reserve the right to reject any proposal past 30 days old from originating date. Our database checks every American address for service options. 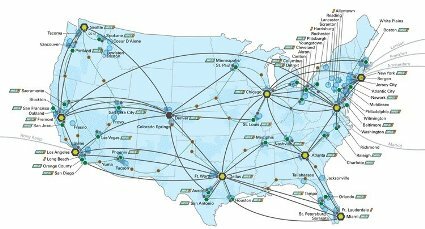 We have one of the largest dedicated internet coverage footprints expanding America, all available with great service and from one reliable and friendly source. Multiple locations managed from one single easy to use online portal. Immediately access technical information, view internet usage tools, bandwidth statistics, messages and comments or easily open a ticket request using our easy to use online portal.